The Braintree connector is an application which is embedded into Linnworks, and developed and supported by eBusiness Guru. It can be used to take payments for Direct Orders in Linnworks. 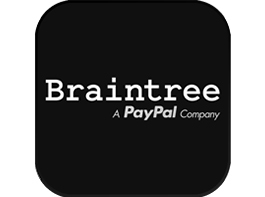 Customers can also check how many payments have been made via Braintree. In the left-hand menu, click Braintree. The first time you open the app, the Registration page will load. Tick the box to show you have read the Terms and Conditions. Click Register Now to proceed. When the app opens, you should see a list of Direct Orders with the payment status Not Paid in Linnworks Open Orders. This takes you to a confirmation page. Click Pay Now to continue. This proceeds to the payment screen, where you can enter the payment card details. Once the card details have been entered correctly, the Pay Now button (at the bottom) becomes active, and the amount to be paid will be displayed. On clicking Pay Now, payment is transferred to your Braintree account and the app returns to the Braintree Direct Orders screen. To request payment via email to the Customer, from the list of orders, click Send Braintree Invoice. You will be directed to the Braintree Page. Click on Log In. If you have an existing Braintree account, enter your registered Email address and Password, before clicking Log In. If you don’t have a Braintree account, click the Sign Up link to create an account. After successfully logging in, you will be redirected to the Braintree Dashboard. In the Up panel, select Settings in Users and Roles. You will need to add your Braintree account details. Click Edit. Click to show Public Key and Private Key. The next screen will show your account’s Public key, Private key and Merchant ID for Test and Live services. Take note of your Live keys for use in the Braintree app. Enter them as shown below, then click on Save. Enter the SMTP server address, the Port Number, confirm if SSL Security and SMTP Authentication is required. Enter the User Name & Password for the account and the From Name which will be used when email is sent from the account. The Reply To address specifies the address that will receive customer’s replies, if you wish it to be different to the address used to send. Logo: allows you to upload a Logo to be displayed in emails sent. Subject Tag: Specifies an order field that can be used in the email subject. Click Add to insert it into the Email Subject field. This page displays a list of payments on your Braintree account. To narrow down the period covered, or to change it, adjust the Dates at the top of the screen to specify the Start and End dates. Payment confirmation SMS messages can be sent using credits. There are several subscription levels you can choose, each corresponding to a different monthly credit balance. If you run out of credits, or are just starting, you can click to select the subscription you need.